Live, play and work in the heart of the Santa Barbara Cultural Center. The premier 1 Bedroom pied-a-terre, with its refined and environmentally thoughtful finishes, was the first to sell with its large private patio overlooking the City. Situated near all of the Alma del Pueblo amenities within the security building and offering secure gated entry to the open-air lobby for guests and visitors. 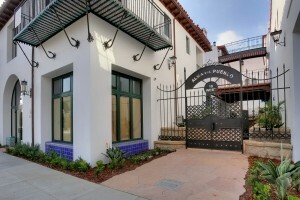 The unparalleled amenities at Alma del Pueblo include private guest suites by reservation at no cost, a conference room/club house, rooftop barbecues and gardens, lounge chairs for relaxing or sunning, secure wine storage, gated parking, and a full time concierge at your service. Not only beautiful and elegant but this award winning Spanish Colonial architectural village received the LEED Platinum Certification.